We know that having a child undergo heart surgery can be a difficult time for the whole family, so we have prepared a Cardiac Surgery Manual that outlines what to expect before and after the procedure. It includes an overview of the staff who will be involved, what to do when you get to hospital, what happens after surgery and things to think about when you're heading home after the operation. If there is anything you are unsure about, please do not hesitate to contact our Clinical Nurse Consultants via our main line, (02) 9845 2345. 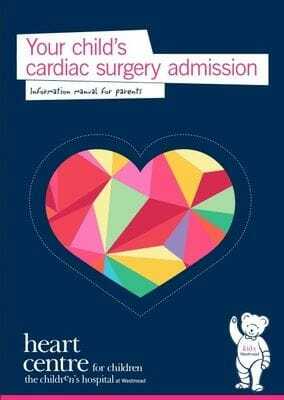 Your child will need to attend the Cardiac Preadmission clinic a few days before their operation. 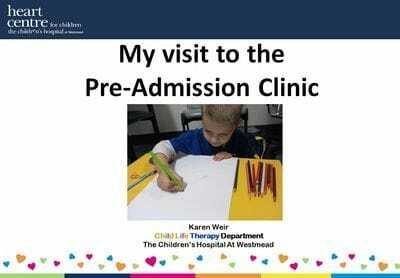 The Cardiac Preadmission Clinic is held in the Heart Centre for Children, located on level three. This clinic provides an opportunity for the team to collect information about your child that will be needed for his/her surgery and use this as a baseline for your child's progress. The clinic also gives families a chance to ask questions about the planned surgery, and become familiar with the hospital environment. Talking with your child before surgery can help them to cope with the experience by knowing what to expect. The hospital environment has many unfamiliar sights, sounds, smells, people and procedures, and these can feel confusing or worrying for a child or young person. For this reason, we have designed the following books and information brochure to support you in helping your child understand more about coming to hospital for an operation. For further information or support, please contact the Child Life Therapy Department on (02) 9845 3717. Please click here for our Factsheet regarding breastfeeding after your baby has had cardiac surgery. When we perform cardiac surgery, it is often very difficult or impossible to repair the heart while it is still beating. So our surgeons and perfusionists work very carefully to stop the patient's heart for a while. The perfusionists use a Heart Lung Machine to perform all of the tasks that the heart, lungs and kidneys would normally do. This machine has lots of pumps, transducers, sensors and other technical pieces of equipment to ensure that we can pump blood out of the body, clean it, add oxygen and other important gases and then pump the clean, oxygenated blood back into the body. This procedure is called Cardiopulmonary Bypass. When the heart has been repaired by the Surgeon, the patient is weaned off the heart lung machine and their own heart and lungs take over their normal function again. The animation below illustrates the main steps involved in an open heart operation and the circulatory support provided by the heart-lung machine. With a few shots of the operating room environment, it also shows how many people are involved in a heart operation - more than 10 people focusing on the child for hours at a time. The animation was developed by Dr Brian Somerville, who leads Sydney company Animated Biomedical, to show what happens. NOTE: It is suitable for viewing by parents and older children with supervision - there are some scenes showing real heart surgery which might make some people squeamish.